Includes lodging, meals, snacks, transportation, t-shirt, camp store money, horseback riding, and all activities. Take a look at a video that has more information on the camp. 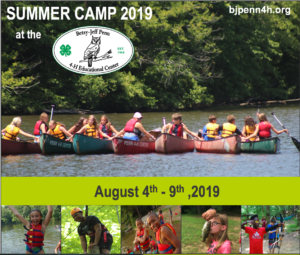 Both residential and day 4-H camping programs have a rich history of providing educational programming to thousands of youth annually through hands-on, experiential learning. Learn to identify and manage resources. Experience a variety of life-long recreational activities. While our 4-H camps and conference centers are each uniquely different based on their geographic location, each camp and conference center offers most of the same activities and resources, including: Archery, Cabins, Campfires, Canoeing, Challenge Courses, Classrooms, Climbing Walls, Dining Halls, Hiking Trails, Outdoor Education, Nature Study, Recreation Halls, School Enrichment, Team building, Waterfront, and Leadership.